One of the most common birds that visit my window feeder in the winter are the White-breasted nuthatches. These small, cute birds can often be spotted climbing up and down the trunks of trees. Their black and white body and long bills make them easy to identify. 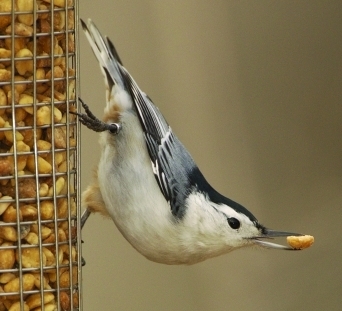 Their bills are nearly as long as their heads and White-breasted nuthatches have black crowns on their heads, with white cheeks and white undersides. They are found year-round in Michigan and do not migrate. In the winter it’s not unusual for a group of mixed species to fly together for protection and to forage for food. They like to eat nuts, suet, mealworms, seed cylinders and sunflower seed. The nuthatches don’t stay long at the feeders though. They prefer to grab a seed and hide or cache their food to retrieve and eat at a later time. They hide hundreds of seeds all over their territory, in a behavior known as scatter-hoarding to keep their stash a secret from competitors and help them survive during bad weather and when food sources are low.